An SFP transceiver module (Figure 1) is a bidirectional device with a transmitter and receiver in the same physical package. The module interfaces to the network through a connector interface on the electrical ports and through an LC termination connector on the optical ports. Electrical interfaces and dimensions are defined in the SFF-8472 industry-standard Multisource Agreement (MSA). The XFP transceiver module (Figure 2) is a bidirectional device with a transmitter and receiver in the same physical package. 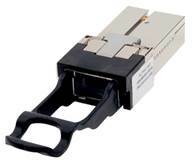 The XFP module contains a 30-pin surface mount connector on the electrical interface and a duplex LC connector on the optical interface. An SFP+ transceiver module (Figure 3) is a bidirectional device with a transmitter and receiver in the same physical package. The module interfaces to the network through a connector interface on the electrical ports and through an LC termination connector on the optical ports. It is identical in size to SFP modules, but capable of 10-Gbps transmission. An CXP transceiver module (Figure 4) is a bidirectional device with a transmitter and receiver in the same physical package. The module interfaces to the network through a connector interface on the electrical ports and through a Multifiber Push On (MPO) termination connector on the optical ports. 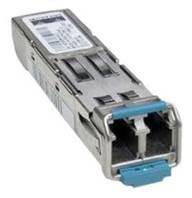 It is dedicated usually for 100-Gbps transmission, and it is only capable of 100GBASE-SR10 connectivity. A CFP transceiver module (Figure 5) is a bidirectional device with a transmitter and receiver in the same physical package. The module interfaces to the network through a connector interface on the electrical ports and through an MPO or LC connector on the optical ports. The electrical connection of a CFP uses 10x10-Gbps lanes in each direction (receive and transmit), while the optical connection can support both 10x10-Gbps and 4x25-Gbps variants of 100-Gbps interconnects (typically referred to as 100GBASE-SR10 and 100GBASE-LR4 in 10 km reach). 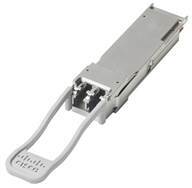 The Cisco 40GBASE QSFP portfolio offers customers a wide variety of high-density and low-power 40 Gigabit Ethernet connectivity options for data center, high-performance computing networks, enterprise core and distribution layers, and service provider applications. 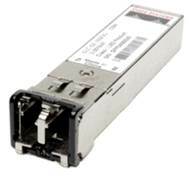 Cisco CPAK 100GBASE fiber modules offer a selection of high-density 100-Gbps connectivity solutions. By using CMOS photonics technology, Cisco CPAK is smaller and consumes significantly less power than alternative form factors (Figure 7). They are fully interoperable with other IEEE-compliant interfaces. Cisco ONS Family modules have well-defined product IDs, making it easy for you to order the appropriate module. ● For the A variable: S stands for SFP, G for GBIC, X for XFP, and SB+ for SFP+. (-10 to 85°C), and I for industrial temperature (-40 to 85°C). ● The CCC variable indicates the supported bit-rate or signal type, such as 155 Mbps for OC-12/STM-1 signal or 2 GF for a tri-rate Gigabit Ethernet, Fibre Channel, and 2G Fibre Channel signal support. ● The DD variable indicates the supported reach, such as S1 for short-reach or intraoffice 1310 nm interface or SX for Ethernet. ● CXPs are denoted by the tag CXP directly. ● CFPs are denoted by the tag CC. ● QSFPs are denoted by the tag QSFP. ● Cisco CPAKs are denoted by the tag CPAK.